So, for day #15 I present to you Glen Billy – my house blend. Three years ago, I started mixing whiskies together at home. 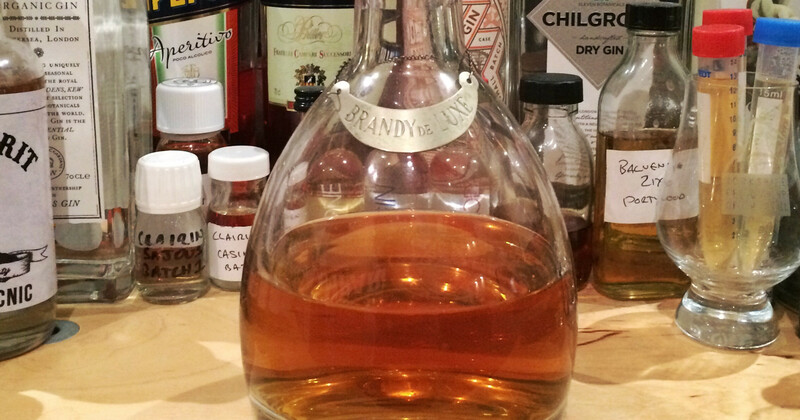 I acquire samples – from friends, shops, producers and The Whisky Tasting Club – and occasionally have bottles of whisky that I don’t get on with, and have long wondered what to do with the things I don’t want to drink. Encouraged by my former colleague Tim, I grabbed an empty Karuizawa bottle that was being thrown out at work – one of the chunky No.1 Drinks decanter-style ones – and filled it up with a selection of bits and pieces. Since then, I’ve been drinking it, topping it up, tweaking it and generally messing about. The Karuizawa bottle has been upgraded to a glass-stoppered decanter – complete with a ‘Brandy De-Luxe’ necktag to confuse visitors – and the number of components has continued to rise. At the moment, I have a simple rule: I am only adding Scotch single malt whisky – Glen Billy, as the scrawled title on the first page of the notebook where I record every whisky I add states, is a blended malt whisky. It doesn’t quite meet all the regulations, as strictly speaking it should be blended and bottled in Scotland to be a proper Scotch Blended Malt Whisky, but I don’t see a swooping night time incursion from the SWA SEAL team as a likely occurrence in my future. I have recorded every whisky I’ve put in, as well as an indication if it was more than a dram or so. 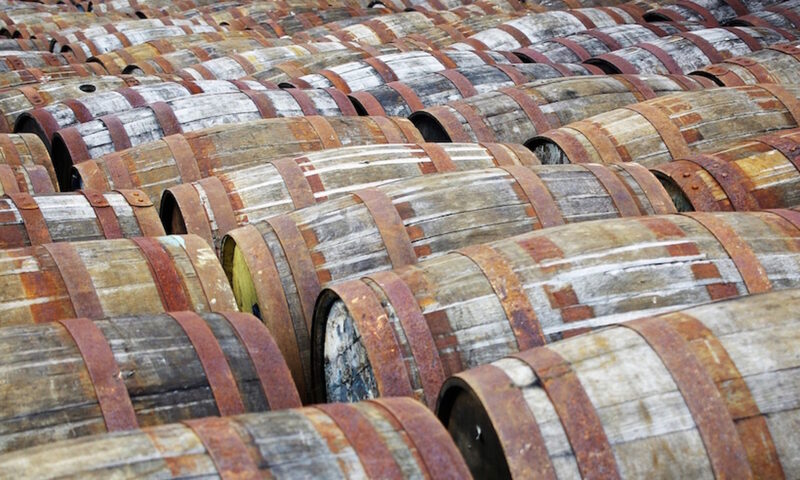 So far – after a start of Glenrothes Select Reserve, Glenlivet 15yo and Cardhu 12yo – whiskies that have gone in have included a single cask Glenlivet, Highland Park 25yo, Smokehead Extra Rare, Big Peat, Laphroaig 10yo Cask Strength, Caol Ila Feis Ile 2012, Berry Bros Littlemill 1992, Bowmore Darkest 15yo (on two occasions), Old Particular Caperdonich 18yo, Octomore Discovery and some old, anonymous samples that I’ve judged for competitions. In addition, after a particular punishing session which emptied most of the decanter, I topped it up with the best part of a bottle of Glen Moy, a cheap but surprisingly decent blended malt that we had lots of at work a while back – an act which pretty much threw a reset switch on the whole project. My approach is a combination of deliberate addition and randomly adding things to clear some space on my sample shelf. I’ve added a few whiskies that I didn’t like, as well as many more that I did, using their flavours to balance out the character of the blend. The aforementioned Tim wrote an article for ScotchWhisky.com, and if you are even vaguely considering having a go at home-blending, then I recommend reading it. Tim’s up to a pair of large carboys now, rather than just bottles, and if you have a chance of trying either the Forbes Heavy Blend or its lighter counterpart, the carefully named Forbes Light Blend, then do so – Mr Forbes is pretty good (or very lucky) at blending whiskies. Anyway, my blend is currently sitting in one of its least smoky states for a while – I’ve not had much smoky whisky open recently, and what I have had has been finished before any can be added to my blend. However, not-uber-smoky is the style I’m after at the moment, which is another benefit of the home-blend – you can tweak it to be whatever you want. Nose: Not all that expressive. A touch of warm leather and earthy spice; hints of marzipan, singed raisins and royal icing. Underneath is something slightly soapy – floral handsoap, Imperial Leather and dry pot pourri – some charcoal and some green ferns. Palate: Intensely sweet to start, quickly fading to weightier and darker notes – eccles cakes, charcoal, rye bread, cherry jam and lots of oaky spice. There are occasional flashes of sweetness in the darkness – Love Hearts and chalky Refreshers in a sea of dark chocolate sauce – but in the end, leather notes win. Finish: Short, with char, burnt flowers and cooling menthol and aniseed. I am unlucky in blending but I’ll read Tims article and try harder…. One day. Tony Bagnall liked this on Facebook.